Rabbit eats hay… rabbit smoked in hay. It sounds strange, I know, but go with me on this. Smoking rabbit, game birds, and fish in hay isn’t crazy. When you think about it, smoking meats in hay is just like using any other smoking medium. But the difference is in the flavor. Meats smoked in hay give off an herbal, wheat quality. It’s far more subtle and sweet than meats smoked in hickory or mesquite. It reminds me of eating a bowl of puffed wheat cereal! Any variety of hay can be used to create a flavor all it’s own. Europeans have been smoking with wheat and dried grasses for more than a century. American chefs have gotten into the hay smoking game in the last decade. Many restaurants have the advantage of purchasing hay from local farmers who produce un-sprayed varieties of wheat such as oat and barley, and grasses like ryegrass, timothy, fescue, bermuda, orchard, and then there is also legume hay like alfalfa and clover. If you are a farmer or know one, grab a few bags of different varieties to experiment. Or if that option isn’t available, you’ll have to go a different route…. Your local pet store!! I was standing in the rabbit feed aisle of my local pet store when a helpful guy walks up and says, can I help you? I said, “Well, I need some hay that’s not sprayed with chemicals”. He said any bag of dried grasses or hay would be fine. And then he asks the question I dreaded to answer. “What kind of rabbits do you have?” Before I answered, I considered I was probably standing in front of an animal lover, and quite possibly a vegetarian…. I replied, “I’m going to smoke rabbit in hay.” After a long pause, he relented, “Oh, okay, that’s interesting.” Then silence. “Well, any will do just fine.” Needless to say, I grabbed a bag, paid and quickly left. LOL Next time I go to purchase a bag, the store will probably have a “wanted” poster up with my photo, name and a bounty on my head for being a notorious rabbit smoker. But the rabbit was good so I’ll take my chances! The rabbits are brined in a simple salt/sugar brine for 24 hours. Then to keep the hay from burning too quickly, I soaked the hay in warm water for about 20 minutes before using it. I placed the brined rabbits on a bed of water soaked hay in a metal bowl, and also tossed some directly on the smoker’s burner. After a total of 2 hours 15 minutes of smoking, the rabbits are removed from the smoker, and gently brush off any bits of hay. They can be eaten as is or served with a sauce of your choice. I was thinking about a nice sauce to go along with the rabbit. About fourteen years ago I remember dining in a small restaurant in Carmel, California. 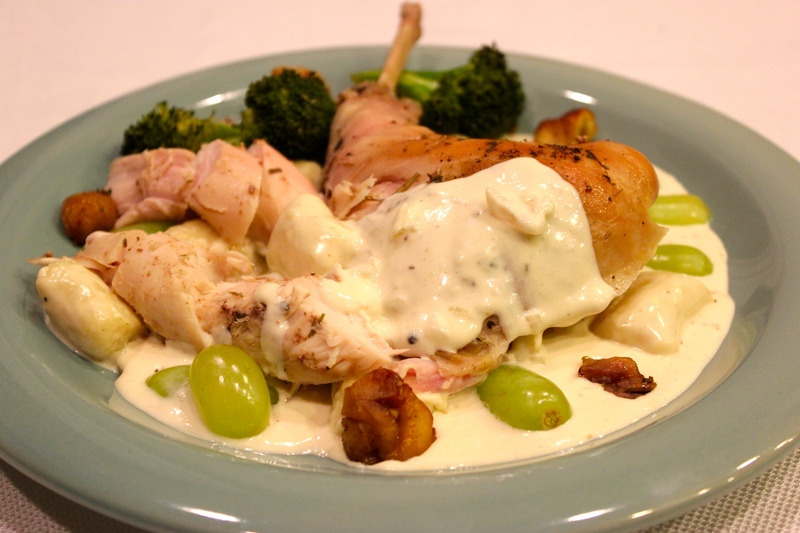 On the menu was fried rabbit with gnocchi and grapes in a cream sauce. The sauce is called a “Veronique” and it’s typically served with fish. When I read it on the menu, I thought the combination of rabbit, grapes and gnocchi was kinda of crazy, but I was too intrigued not to try it, and I was so happy I did. It was amazing!!! The gnocchi was so tender, and the grapes were just sweet enough and paired surprising well with the rabbit. If you like, you can substitute wide egg noodles, or mashed potatoes for the gnocchi. I made a batch of potato gnocchi the day ahead, and poached it in water, then drained it and refrigerated overnight. You can find my recipe for gnocchi here. 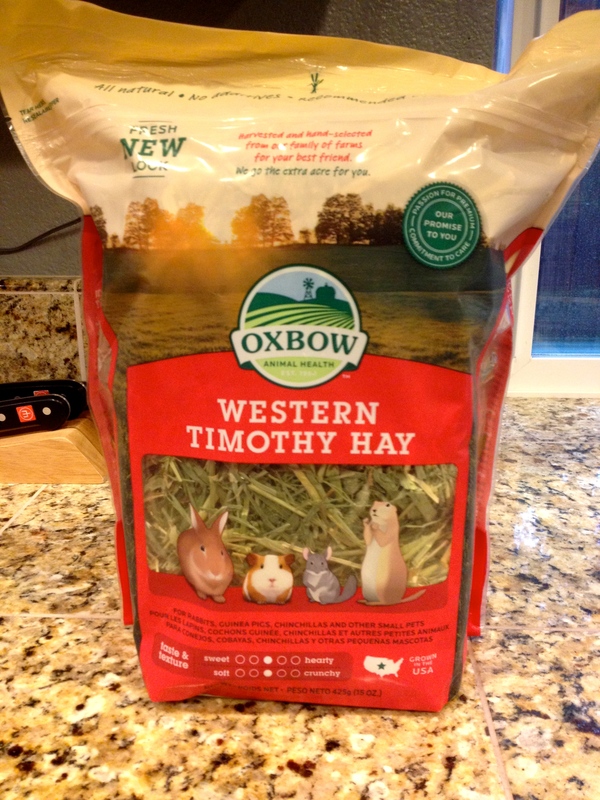 I bought this bag of timothy hay at my local pet store. I used half a bag for the smoked rabbit and the sauce. I soaked the hay for twenty minutes in a large bowl of warm water. I placed the brined rabbits on a bed of hay and added another cup of wet hay around the rabbits and a little on top. I placed the rabbits in the smoker and added wet hay to the burner to begin smoking. I turned the rabbits after 1 hours 15 minutes, so the smoke penetrates into both sides. Once the rabbits have smoked for a total of 2 hours and 15 minutes, they can be served as is or with any sauce you’d like. While the rabbit was smoking, I made a classic Sauce Veronique using hay-steeped cream. 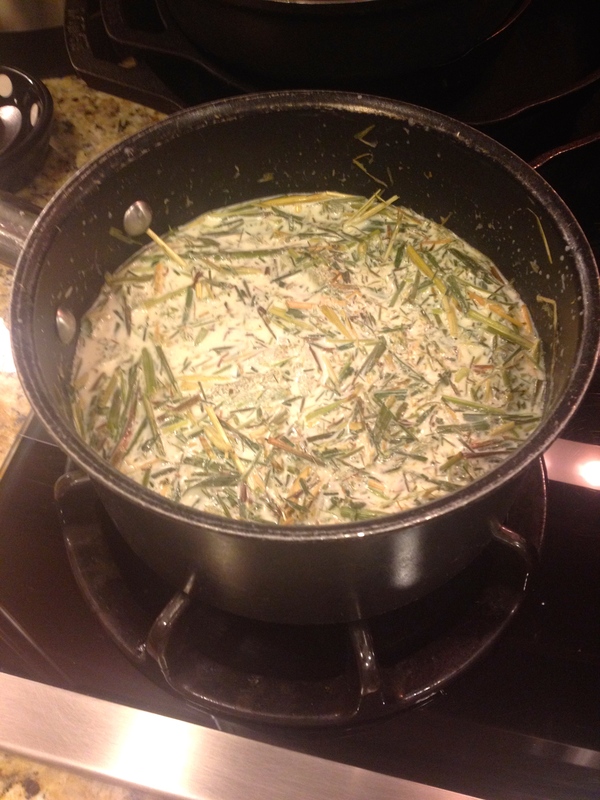 After placing 2 cups hay on a cookie sheet and baking it in a 350ºF oven for 9 minutes to get a light smoke on the hay, I added it to a large sauce pot and poured the cream over top. 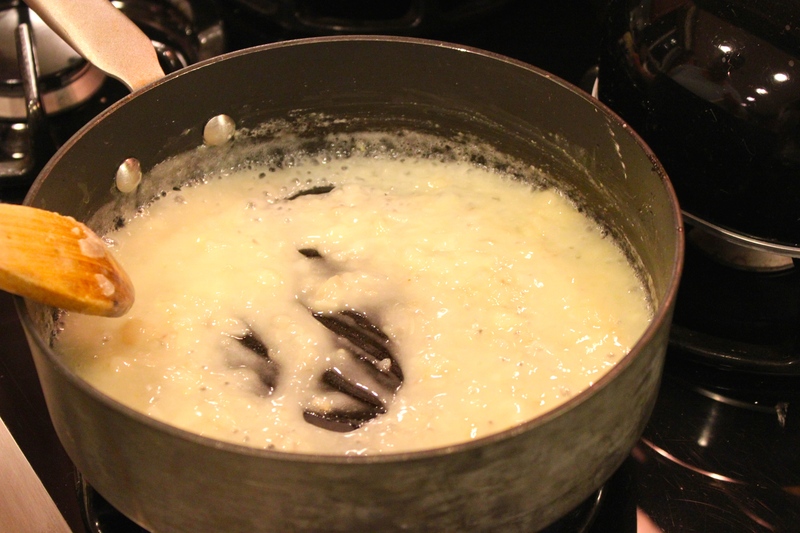 I heated the pot of cream on a low flame to allow the cream to absorb the toasted hay flavor. After the cream steeped, I placed a fine mesh strainer over a bowl, and strained out the hay, and reserved the cream. In a large frying pan, I sauteed a minced shallot in butter and oil. Then sprinkled corn starch over the shallots and stir. I then added brandy, and chicken stock and stirred to thicken. 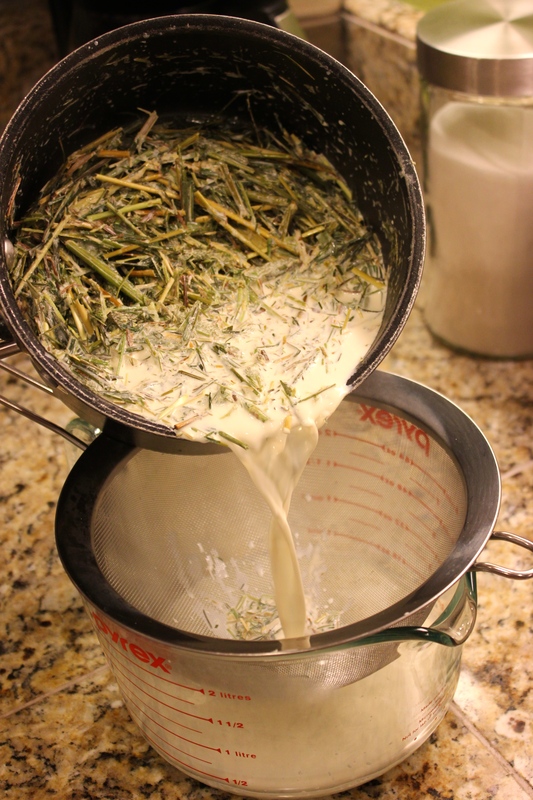 Then I poured in the hay-steeped cream and stirred for another 5 minutes. Then I added the gnocchi and sliced grapes just to warm through. I seasoned with white pepper and salt to taste. I served it over the smoked rabbit and a side of baked broccoli and chestnuts. 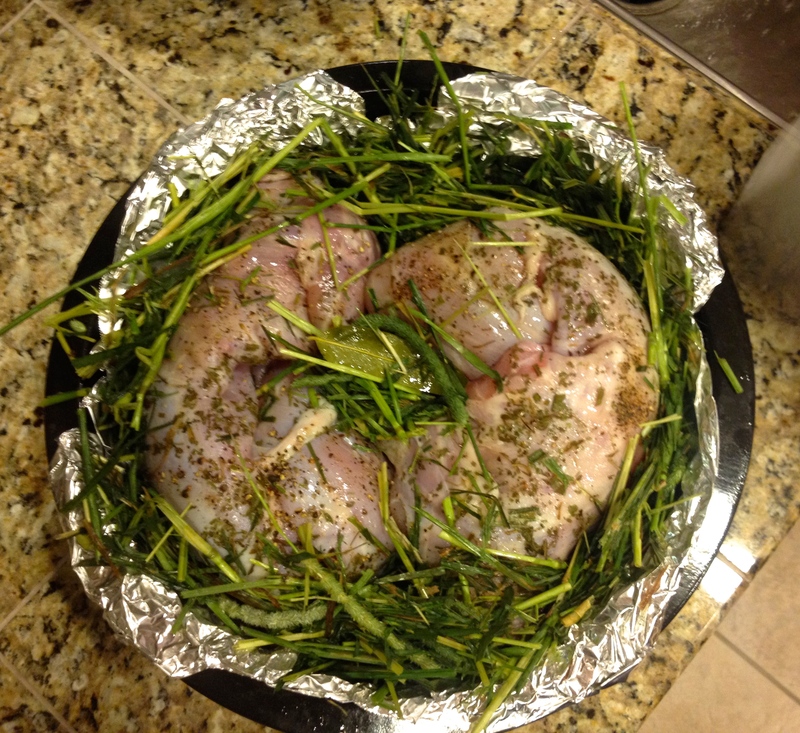 Dried Timothy grass used to smoke cottontail creates a sweet, herbal, wheat flavored bunny. I served served the rabbit with a double dose of hay flavor by steeping cream in baked hay as a base for a sauce Veronique. Alongside homemade gnocchi and sliced green grapes makes this dish an Autumn favorite!! Heat half a quart water in a sauce pan and add the kosher salt and sugar, and stir to dissolve. Pour the ice, salt/sugar water into the remaining cold water. Add the rabbits, lemon verbena, and garlic, and allspice into a large bowl. Pour the brine over, cover and refrigerate, overnight. One hour ahead of smoking, remove the rabbits from the fridge to bring to room temperature. Twenty minutes ahead, Pre-heat the smoker. Also twenty minutes ahead, in a large pot or bowl, add the hay and enough warm water to soak the hay. Remove the rabbits from the brine and drain well. 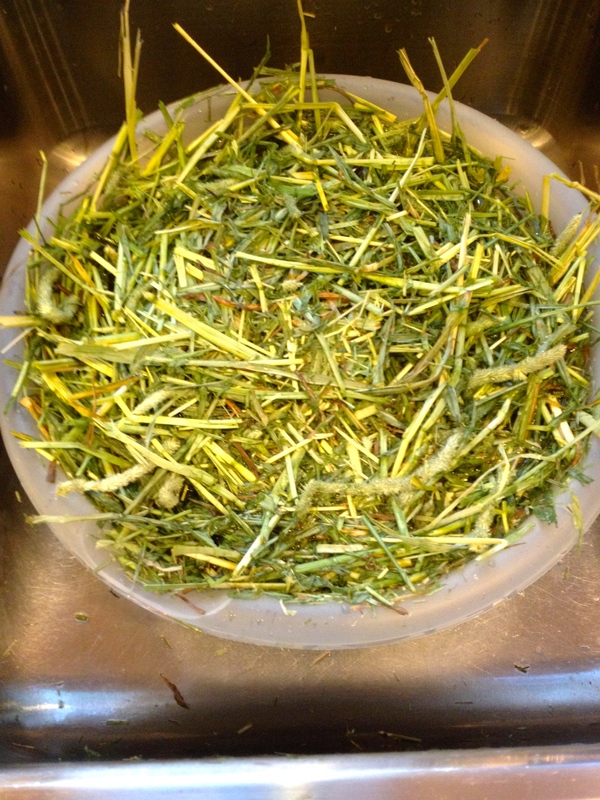 Place a small layer of wet hay (about 1 cup) in the bottom of a large metal bowl and place the rabbits on top. Add another cup of wet hay around the sides and on top of the rabbits. 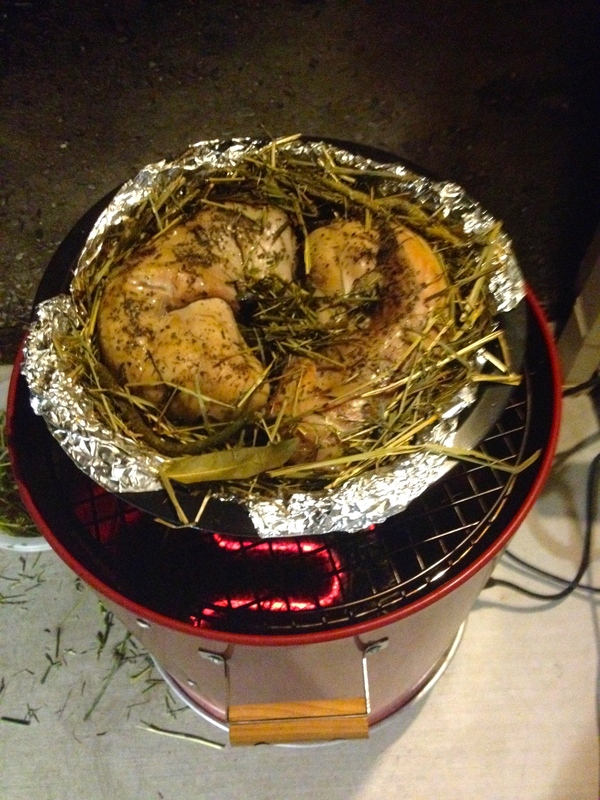 Place the metal bowl on the top of the smoker. Add a few hands full hay to the bottom on top of the burner. Place the lid on the smoker and set a timer for 1 hour and 15 minutes. From time to time, add more wet hay on the burner to build up the smoke. When the timer goes off, turn the rabbits over so the smoke absorbs on each side. Replace the lid, and set the timer for one hour. Continue to add wet hay to the burner. After a total of 2 hours and 15 minutes, remove the rabbits and brush off any loose hay. 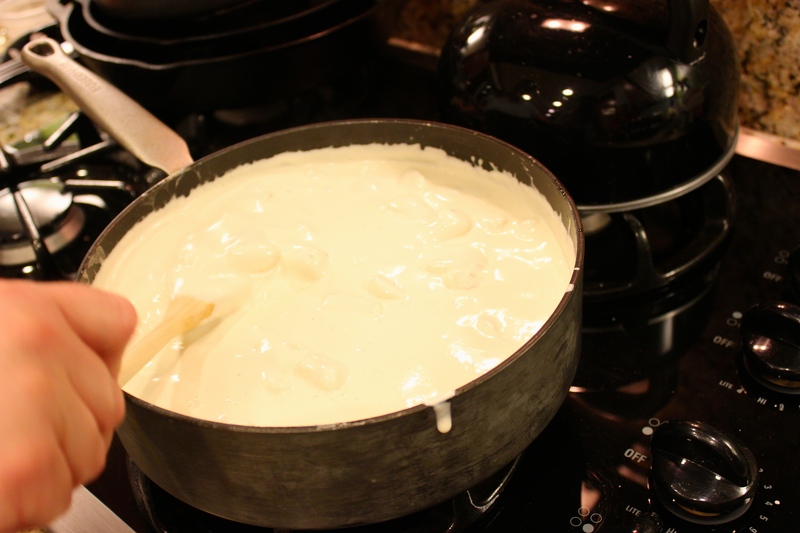 Serve as is, or with the cream sauce. Spread out 2 cups of dry hay on a cookie sheet. Place the cookie sheet in the oven and bake hay for 9 minutes or until it starts to smoke. 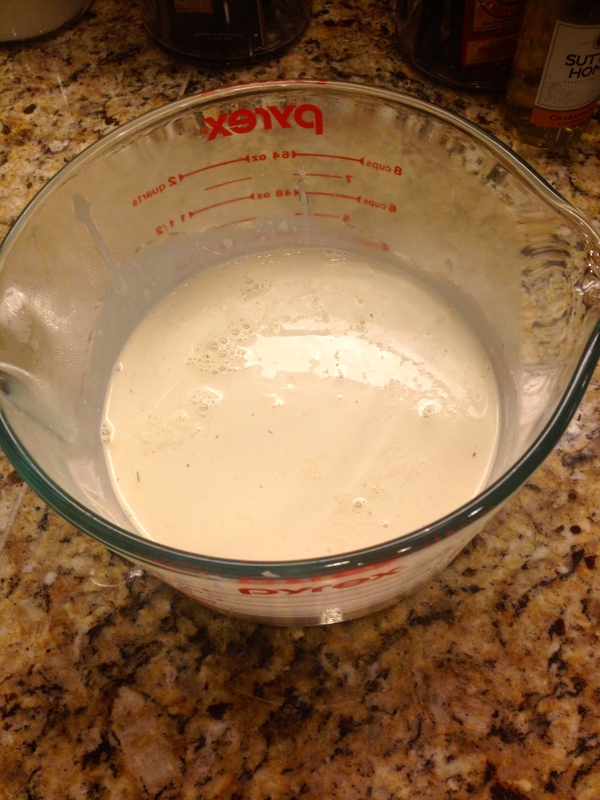 Add baked hay and heavy cream to a large sauce pot. Bring the pot to a very low heat. Steep the cream in the hay for about 45 minutes (Watch the cream doesn’t scorch, you just want the flavors to combine). While the cream is warming, slice the grapes in half and set aside. Also pre-boil the gnocchi or noodles, drain and set aside. After the cream has steeped for 45 minutes, place a very fine strainer over a bowl and strain out the cream and discard the hay, reserve the cream. In a large frying pan, sauté the minced shallot in butter and oil over medium heat. Sprinkle the shallots with cornstarch, and stir to coat. Pour in the brandy, chicken stock and stir until thickened, about 2 minutes. 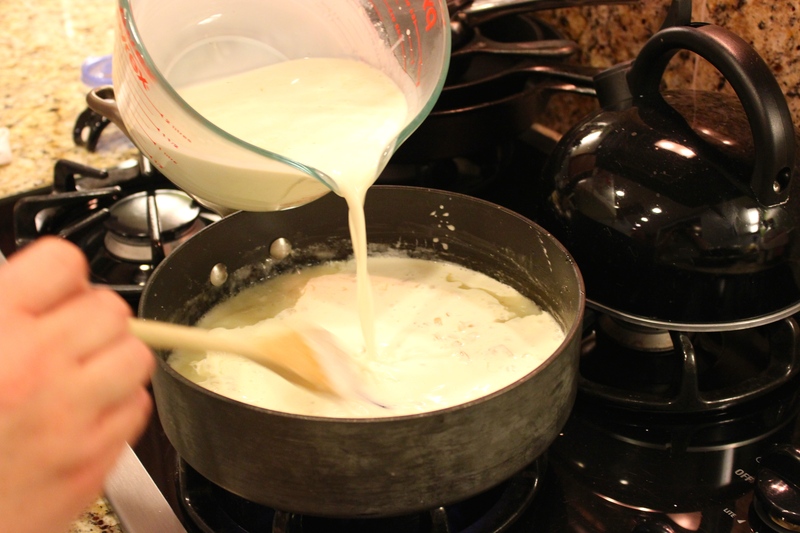 Add the hay-steeped cream and stir to continue to thicken, about 5 minutes. Add the gnocchi (if using) and grapes, and heat through. Season with white pepper and kosher salt, and serve with the hay smoked rabbits. I also serve the rabbit with broccoli and chestnuts baked in a 400ºF oven for about 20 minutes.